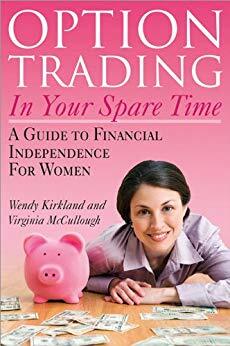 This book, geared specifically toward women, describes how to be a successful option trader, even if you hold down a full-time job or are a full-time stay-at-home mom. While option trading is definitely not a risk-free method of investment, for women who have a few hundred extra dollars that they want to use to break into investing, option trading can be a lucrative way to make money. This book explains what everything means and how to be an option trader in easy-to-understand, step-by-step ways that makes it great for the beginner or the more advanced investor. It is primarily focused on trading online and tells you what you need to know to better your chances of being successful. Good trading info - gives you an quick overview of the markets and option trading. Provides good info on how to set up your chart screens with types of indicators, and why to use those indicators. Examples are included on entry/exits based on the indicators,... Overall it is a good book for someone getting started. I felt as if Wendy were sitting next to me having a cup of tea and saying "You can do this!" An easy read and also a great study guide as I keep the book handy for quick reference.